PESTUK now provide Waltham Cross pest control services. Waltham Cross is a town in Hertfordshire. It is immediately north of both the M25 and the London Borough of Enfield. The town is within the borough of Broxbourne, the metropolitan area of London and the Greater London Urban Area, with Chestnut to the north, Waltham Abbey to the east and Enfield to the south. Waltham Cross is the most southeasterly town within the county of Hertfordshire. PESTUK are full members of the BPCA, the governing body for those serious about dealing with public health pests via control and prevention. A BPCA member company will have trained staff, will be fully insured and will hold to the code of practice set out by the BPCA. We recommend the use of a BPCA company to avoid any cowboy companies that would just be a waste of money. If you have a bee nest you will probably see bees entering a hole in the ground, a wall or roof. Where they nest often depends on the species. It may not be necessary to destroy the nest. It may be possible in some cases to remove the nest. The operator will be able to tell you what sort of bees they are, usual species include Bumble Bees, Honey Bees Masonry or Mining bees. There are also sub species of wild bees within these groups. 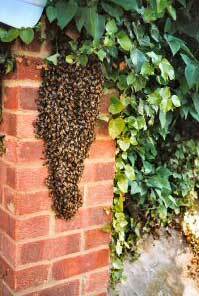 Honey Bees: the nest will have thousands of bees and they will swarm around the entrance of their nest. Commonly these are in chimneys however they will use any cavity. A swarm if met, is when part of a hive splits and a Queen accompanied by drones and several thousand workers will look for a new nest site. Bumble Bees: These are the largest of bees seen and usually nest in the ground or in places such as compost heaps. Recently they have been found using lofts. Generally they are not aggressive although they can sting. Mason/Mining Bees: These types of bees will be seen entering many holes in the ground or in brick mortar. There is no Queen as all the females of this type lay eggs.